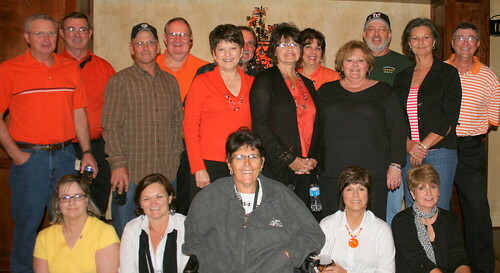 The class reunion gathering was held on October 23, 2010, at Bonne Soiree in Erath, LA. Because this was not a 5 year or a 10 year reunion, we had our annual class dinner. Our night was a fun night of good food, good friends and fun. Thanks to Jocelyn, we have a lot of pictures to share with everyone. Thanks Jocelyn! 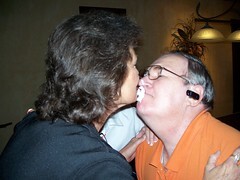 Dale Babineaux and his wife, Marsha came in from Texas and surprised everyone! It was good seeing Dale again; our 10 year class reunion was his last visit with us! I’m sure we all looked a little different to him! Chris Mayard and Charlene Bourque’s husband (Neil ) cooked an awesome chili for the evening. Several finger foods, deserts and corn bread was served. 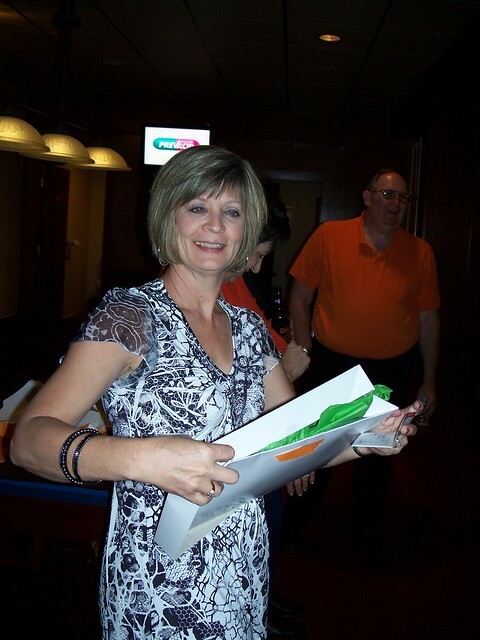 What an exciting night it was for Charlene Bourque! Chris Mayard sold “An Arm-Length” of tickets for $5.00. 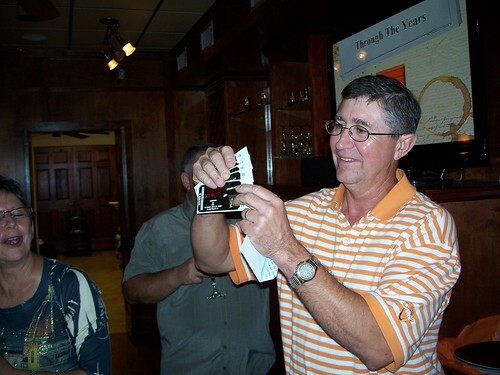 Everyone bought tickets that night with the hopes that they would become the 2010 50/50 winner! In total, we sold $260.00 worth of tickets. The Class of 73 bank account kept $130.00 and Charlene went home with her $130.00. The way this raffle worked, is everyone bought $5.00 worth of tickets at a time. One piece of the ticket was put in the drawing bowl and the other piece of the ticket was given to the class mate. Then the winning number is pulled. 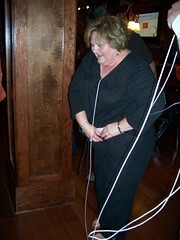 When the winning number was called, Charlene was disappointed because she thought she had lost! She yelled, “I missed it by just 3 numbers..” But then she realized the winning number was on another set of tickets. Boy was she happy! Did you go shopping Charlene? 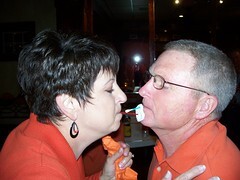 The “Pretzel & Q-Tip Game” had everyone roaring with laughter! You think it’s easy to stick a Q-tip into a pretzel hole when your eyes are on top and you can’t see? Well think again. 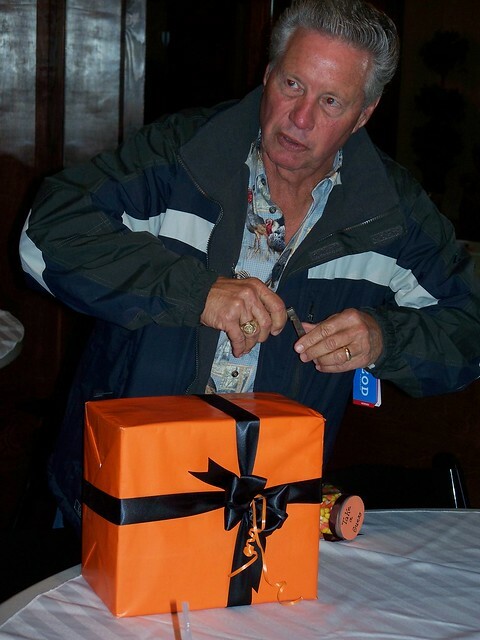 The object of the game is to pass the preztel to the last person as quickly as possible. You begin by forming 2 teams. Each team is split in half and the team member who passes the pretzel to the last team member…. Wins! It takes a lot of patience, skill, determination, balance and control to pass the pretzel to the next person. Then it gets worse… The person intercepting the pretzel has to next walk over to the next team member and do it “again” without dropping the preztel. In some instances, guidance was given by the spectators and other team members. (Sandy’s husband), Denette Viator, Evelyn Richard, Ann Derise, Rhonda (Michael Babin’s wife), Neil (Charlene Bourque’s husband), Ricky Segura, Dale Babineaux and Scott Landry. Sandy and Benny seem to be VERY involved in passing the preztel for their team and Evelyn and Dale are being VERY CAREFUL! Somehow Charlene and Darcy seem like they are enjoying just playing with the preztel! By being on the “The Winning Team” you were automatic candidates to a drawing. 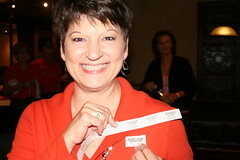 Teena LeBlanc pulled The Winning Person’s name. It was Ricky Segura. He won 6 tickets to the UL game on November 20th. Go UL! This game had everyone in stitches they were laughing so much! “Turn Me On with a String”! Boy did this get everyone worked up! The object of the game was to form two teams. There were two very long strings with a weight tied to the end of both strings. 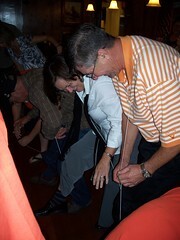 The string was to go under your clothes and down the first persons neck, down the chest and down to your ankles. Then up the next team members neck, chest and ankles and continue on until the last team member. The team whom the weight reached the ankles of the last team member WON! The Winning Team – Nina (Scott Landry’s wife), Fran (Darcy Delcambre’s wife, Ann Derise, Benny Migues (Sandy Delcambre’s husband) Sammy Delcambre, Ricky Segura, Jim Wiggins (Denette Viator’s husband), Lena Dore and Neil Hebert (Charlene Bourque’s husband). These team members were eligible for the drawing to win a gift. Nina Landry “Turn Me On With A String” Winner! Teena LeBlanc did the honor of pulling a name for a drawing. The names in the hat consisted of everyone present at the party! Sandra Lopez won! She won Halloween and Christmas decorative placques. There were door prizes, and we played games for prizes, too! We started our night with fun by having a “Count The Corn” contest. The object of the game was to determine how many candy corn was in the jar. Doyle Dooley (Ann Derise’s) husband won the price. Doyle’s prize was a picture frame and a lamp oil.